It seems fitting that in the UK at least, we’ve seen spring arrive just in time for La Primavera. However, in recent years it’s been the lack of good weather that has characterised the racing at Milan-Sanremo, with snow, rain and landslides featuring. Thankfully for the riders this year, it will have the sun on their backs all the way to Milan. The route from Milan to San Remo hasn’t changed from last year, so forgive us for repurposing some of our thoughts from 2016! The sternest climb, Passo del Turchino, comes before half the distance has been covered, but really it has little say in the final makeup of the race, other than making its contribution to the relentless sapping of energy that the riders have to suffer through. We then come to the trio of ‘Capi’: Mele, Cervo and Berta. On a normal day these are lumps in the road that wouldn’t trouble the average club rider, but in this race, when they come after 230km of riding, they’ll host the first dramatic scenes — with riders flexing their calves as they approach the business end of the race. However, the real action will begin with around 31km to go, on the approach to the famous Cipressa climb, where the first plucky riders will make their attacks. 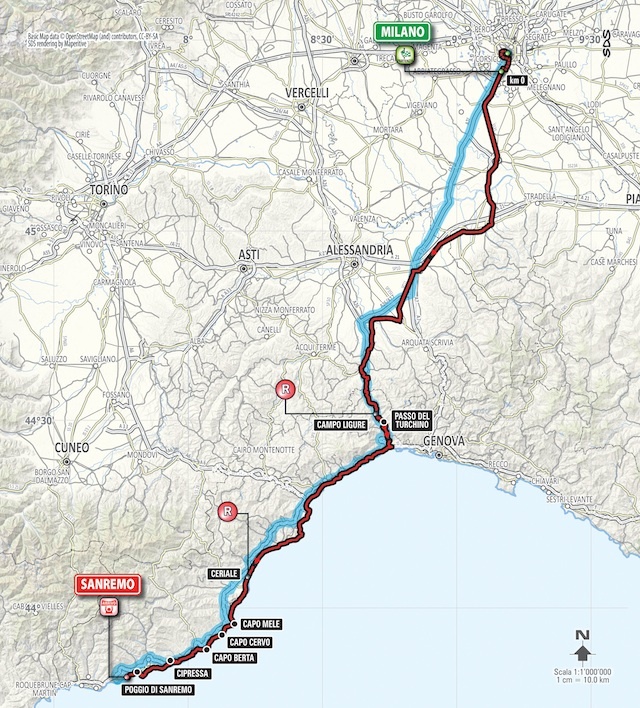 But, as Inrng has pointed out, the earliest that a winning move was made in the last 10 editions is on the yet- more famous Poggio, 7.3km from the finish. It was here that Simon Gerrans chased down Vincenzo Nibali’s attack in 2012, and went on to take his first big win. The climb itself, in isolation, is nothing special and goes without official category. But in the context of this race, it becomes one of the most iconic rises in pro cycling, and the scene of countless heroic attacks, pursuits, collisions, and crashes. And, once again, we expect it to play the final decisive role in this year’s race. The last three years have seen the race climax with a reduced bunch sprint. No snaking trains here if all goes to plan, and with a bit of luck, the sprinters will have one or two teammates in front of them to help fight and secure a good position as they thunder onto the Via Roma. That is of course if the small group or solo rider has escaped on the Poggio, but we haven’t seen this happen since 2013. Here are the riders we’ll be looking out for as the race heads towards San Remo. Peter Sagan is a rider who is always the favourite for any race he enters. 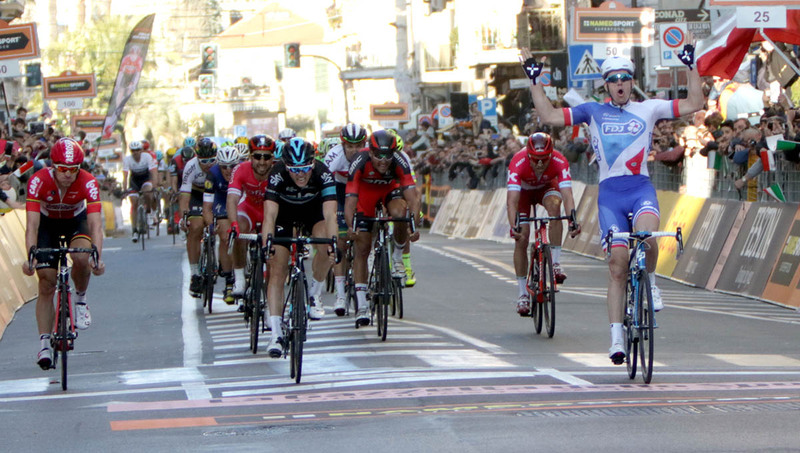 He is also one of the few riders that could win Milan-Sanremo from either a sprint of late attack on the Poggio. His stage win at Tierrno-Adriacio on Stage 5, showed that his legs have the form and pace within them to break away on a short, sharp climb. He was pipped at the finish of Stage 6 in that race by Fernando Gaviria, and this is perhaps why we might see him favour a Poggio attack, rather than fight it out with the pure pace of riders like the Columbian. His team also have a backup for sprint in the shape of Sam Bennett, who took his first World Tour stage win at Paris-Nice. He has said that he went on his first altitude training camp earlier this year and the result of which have seen him finding getting over the categorised climbs in France a lot easier, so the Cipressa and Poggio will be small fry. You never know we could see the first Irish winner of the race since Sean Kelly in 1992, also on St Patricks Day weekend. Greg Van Avermaet had his best finish at this race last year, 5th and has carried on his stellar form from last year into 2017. He retained his Omloop Het Neiusblad title last month and with the Italian trio of Oss, Caruso and Quinziato in support, he could be in line for a first monument win. Like Sagan, he could also look to launch his attack early on the Poggio and shake off the fast men. We’ve mentioned Fernando Gaviria above and going into the week of the race he is one of the favourites. He showed in his debut last year that he could be in contention at the finish after nearly 300km, but disaster struck as he clashed wheels with Greg Van Avermaet and crashed out in the final hundred metres. He took a great win at Tirreno-Adriatico, beat Sagan, but he crashed in training this week and appears to have injured his hand. How he has recovered from this over the last few days will determine if he’s able to be in contention again this year. If he is, few could beat him in a sprint. If he isn’t then Quickstep have a few other options. Julian Alaphilppe and Philippe Gilbert have both shown good form during Paris-Nice, Alaphillpe more so with a stage win and spell in the leader’s jersey and a 5th GC placing. You expect to one if not, both of them animating the race on the Poggio or perhaps before. Tom Boonen will be a backup sprint option at a race he has never won, second in 2010 is his best finish. The cobbled monuments are his focus, but if a chance arrives here then he will jump on it. Defending champion Arnauld Demare looked in great form at Paris-Nice, taking the win on Stage 1 and then withdrawing before the high mountains to save himself for this race. He was a surprise winner last year, but it wouldn’t be a surprise to see him take back t back wins. Alexander Kristoff is another past winner that could rack up a second Primavera crown. After taking stage wins and the points jersey at the Tour of Oman, he had a frustrating Paris-Nice where he was in the mix for the sprints but failed to take a win. He left before the start of the final stage and the message coming out of the team was that all his focus was now on this race. He has lost key personnel in the shape of Guarnieri and Paolini, but that won’t stop he still being a force as the race hits the Via Roma. There are some Italian riders who are in great form of late and the home crowd would dearly love a home win, the first since Pippo Pozzarto in 2006. Sonny Colbrelli was 9th last year, but his first big win on stage 2 and was the best of the rest on the final stage. This si his first year racing in the World Tour and we haven’t seen in such good form prior to this race. His team Giovanni Visconti will likely eye a Poggio or Cipressa attack and the young backup sprinter Niccolo Bonifazio will be waiting in the wings if Colbrelli falters, however the cold northern French weather early in Paris-Nice saw him abandon, so a lack of km in the legs could be an issue for him. Fabio Felline is also in fine form of late. A fourth place at Omloop Het Nieuwslbald has been his highlight and he has been active in the breaks at Tirreno-Adriatico. He’s another rider who will look to attack on the Poggio and hope to stay away. However, it will be his German teammate, John Degenkolbb, who will be the main option for Trek-Segafredo. Unable to defend his crown last year, he will surely be looking to make amends. He has been very consistent so far this year, finishing at least 5th in the sprints he has contested. He looks to be holding his best back for this race and the whole fo cycling would welcome a triumphant return for him to this race. He’ll have support from Jasper Stuyven, who has also been in scintillating form during the opening classics weekend. After some brief positive column inches written about their wins at Paris-Nice for Sergio Henao and Strade Bianche for Michal Kwiatkowski, the focus on Sky has turned back to internal medical practices and contents of jiffy bags. Kwiatkowski attacked the descent of the Poggio last year and we’d expect him to employ similar tactics this year. With Ben Swift now at UAE Team Emirates, the sprinter duties lie with Ellia Viviani has had a poor relationship with the race, his best finish 84th in 2016. The distance could be a factor but for an Italian sprinter of his caliber, he should produce a better showing than that this year. Speaking of Ben Swift, he has very much been the near man of the Via Roma with 3rd in 2014 and 2nd in 2016. He moved teams to get more opportunities at races like this, but it will be interesting to see who is favoured between him and his Italian teammate Sacha Modolo. We’d favour the Brit, but then we are slightly biased! Another ride who moved teams in the winter to gain great opportunities is Michael Matthews. After starting his season with Paris-Nice last year, by taking the prologue and a stage win he crashed in before the Cipressa and never made it back to the main group. He again started his season at Paris-Nice, and whilst he didn’t have the same success, he looked strong in the sprints and will be keen to make amends for last year. The rider that nearly came to blows with Matthews last year at Paris-Nice was Nacer Bouhanni. He was a DNF on Stage 2, so we were denied a rematch. But after taking at the minor race Nokere Koerse this week he seems in decent form, despite it being against slightly weaker opposition than he’ll face here. Orica Scott comes with the previous winner Simon Gerrans, Caleb Ewan and Magnus Cort Nielsen. Out of all of them, the Dane is the rider we would favour, in a race of this distance. He has shown decent form in the early classics races and whilst Ewan has the raw speed, the length of Milan-Sanremo could leave him wanting when it comes to the finish. Gerrans best days are behind him, but dont rule out a late attack at the foot of the Poggio is he’s feeling good. The first Monument of the year, this Saturday s Milan-Sanremo is all about the tense finish, the paradox of the longest race of the year that s often decided in the final metres and one of the rare one day races where grand tour contenders and sprinters can each stake their claim.